The Museum of the White Mountains is not an art museum, or a science museum, or a history museum. Instead, the Museum of the White Mountains brings together art, science, history, and more to create a multidisciplinary understanding and experience of the White Mountains region—both physically and virtually—from its ideal situation at the gateway to the White Mountains themselves. “Plymouth State University will be the leading place for teaching and research on the White Mountains,” says PSU President Sara Jayne Steen. 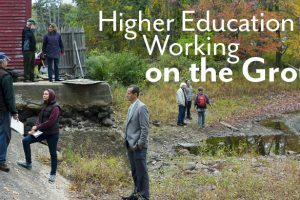 As a regional comprehensive university, Plymouth State’s mission is, in part, to serve and celebrate New Hampshire’s Lakes Region and North Country, home to the White Mountains. According to President Steen, the idea for the Museum of the White Mountains came out of discussions of this location being a natural learning laboratory, filled with cultural history, tourism, art, and environmentalism. “The idea gained momentum on campus faster than anything I’ve ever seen,” President Steen recalls. Across campus, from all disciplines, people had exciting ideas that tied into the concept of the Museum of the White Mountains. Guided by founding director Catherine Amidon along with her staff and an advisory committee made up of men and women with a deep reverence for and interest in the White Mountains, the museum is already at work mounting exhibitions, acquiring and cataloging collections, and providing educational experiences. Amidon came to Plymouth State in 1999 as director of the Karl Drerup Art Gallery. President Steen says Amidon was “the perfect choice to be founding director of the museum” because of her “real passion for the White Mountains and for the collections.” Amidon’s background combines extensive scholarship and exhibition experience with lifelong participation in recreational activities in the White Mountains. The museum’s purpose is to preserve and promote the history, culture, and environmental legacy of the region, and to provide unique archival and digital learning experiences for researchers, students, and the public. Using a transdisciplinary approach, Amidon notes, “will allow us to leverage the intellectual capital of the University.” The museum will use a pluralistic, democratic process, representing teamwork rather than a single individual’s curatorial vision. Several years ago, when the congregation of Plymouth United Methodist Church built a new home on Fairgrounds Road, the former church at 34 Highland Street became part of the Plymouth State University campus. Close to Belknap and Mary Lyon Residence Halls, the Bagley House, and Lamson Library, the little brick church built in 1946 fit right into the campus. The environmentally sensitive renovation of the old church into the Museum of the White Mountains began with a two-phase architectural plan by the Maine architectural firm Barba and Wheelock, using LEED Silver standards as a guide. The construction will take place in two phases, to be completed by the Bauen Corporation of Meredith, NH. Phase I includes a large central exhibition space, storage for collections, offices, upgrades to the building’s systems and exterior “envelope,” and ADA-compliant access, including a ramp landscaped to look like a nature trail with regional plantings, so that, as Amidon says, “the educational experience begins before you even enter the museum.” When Phase I is complete, the building will officially open. Phase II, for which a fundraising campaign is currently under way, will expand the building by 4,000 square feet, upgrade HVAC systems to museum-quality controls, and upgrade storage for collections to meet museum-level requirements. There will be a classroom, seminar room, and lecture hall, as well as a reception area and administrative support spaces. Over the course of his lifetime in the state, the late photographer Daniel Noel, of Intervale, NH, built an impressive collection of photographs (including rare glass-plate and stereoscopic images), postcards, hotel ledgers, first-edition and other early books, maps, prints, and paintings—all relating to his beloved White Mountains. Noel was looking for a single institution that would appreciate his collection and make it available to students and researchers interested in the region. Hamilton, Amidon, and Steve Barba (no relation to Barba and Wheelock), PSU’s executive director of University Relations and himself a collector of White Mountains materials, visited Noel, discussed his goals for his collection and, got to know “a stellar human being at the ultimate turning point in his life,” Amidon says. 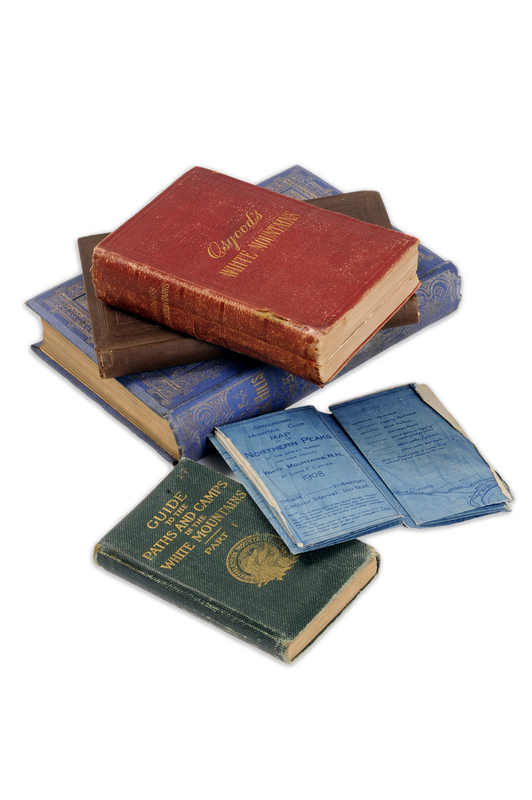 The gift of this founding collection has inspired other donations of books, photographs, artwork, and White Mountain memorabilia of the grand hotels and other tourism destinations. Amidon points out that while the Museum of the White Mountains is building its own collection, many institutions have repositories of important White Mountains materials. “By working in partnership with these institutions, the Museum of the White Mountains strengthens connections and increases access between institutions,” Amidon says. Beyond Brown Paper, which documents the history of the Brown Company of Berlin, NH, which made paper from the late nineteenth century until the mid-1960s. Protecting the Forest: The Weeks Act of 1911, which tells the story of the contentious effort to create a truly national forest system. The exhibition travelled from PSU’s Silver Center for the Arts to eight venues in northern New Hampshire. As Time Passes Over the Land, an exhibition of White Mountain School landscape paintings that capture the natural beauty of the White Mountains and reflect mid-nineteenth-century logging and the growing industrialization of the region during that time. Industrial Explorers: Research and Development at the Brown Company investigates the wide array of products developed from forest resources at the Berlin company from 1915 to 1968. Guy Shorey: Among the White Hills explores the work of a preeminent North Country photographer. This show was developed in partnership with the Mount Washington Obser-vatory, which owns the Shorey images. Next year, Beyond Granite: A History of Mountains and People will explore how the geology of the White Mountains has shaped human activity, life, and culture, using physical models and digital media to share stories of White Mountain science, art, culture, and recreation. “The Museum of the White Mountains is already a teaching facility,” Amidon says. Both collections and exhibitions are providing learning opportunities for Plymouth State students and other scholars of all ages, in New Hampshire and beyond. Collections Assistant Lindsay Burke oversees the intake of collections and trains students to document, scan, and tag images. Students from such wide-ranging majors as history, heritage studies, business, communications, and education are learning the intricacies of physical and digital cataloging, as well as writing brochures, talking to local businesses, and introducing the museum to people in neighboring towns. Burke explained that the students’ work is a mixture of what needs doing and where their interests lie. Sociology major Bethany Cook took on transcribing around 900 postcards from the Noel collection. History major Holly Parisi managed social media, maintaining the museum’s presence on Facebook, Twitter, and Foursquare. The work that Burke and the students are doing now will make it possible for researchers anywhere in the world to go the website and use the collections virtually. When the physical museum opens, researchers and other visitors will also be welcome to study the objects in the collections directly. Cultural institutions are well-known to contribute economically to their areas. President Steen notes that arts and cultural outreach is part of what Plymouth State University does for the region. Amidon says that the museum will provide an additional cultural option for residents and visitors, and that it will attract a new type of visitor to the Plymouth State campus—those who know and love the White Mountains but aren’t yet familiar with PSU.